Before any confusion sets in, there has been a name change. No, it’s not new. It just obviously takes me a while to cotton on to these things. The Karoo Desert National Botanical Garden was known as the same, but without the ‘Desert’. The fact that this change came about in 2001 had totally slipped me by. The addition of ‘Desert’ is to point out the obvious – that plants grown in Worcester are of a particularly arid nature; they’re really dry and hardy to survive the heat and wind, in other words. I love desert plants. Those thick, bulky leaves that hold water for months on end with no apparent limit to their ability to withstand the desire for more (that I had such willpower when it comes to food). They manage not to wilt, scorch or complain in the heat of the summer months, and then at the vaguest suggestion of rain, they explode into a cacophony of colour and produce flowers that leave you spellbound. It is hard not to be passionate about succulents therefore. Even the bog standard pelargonium produces flowers that inspire. My desire then, to see the gardens, did not begin with my visit to Worcester in February this year. Oh no. It started ages ago. Every time in fact that we passed through Worcester, which for some reason, given that we seemed to holiday at every given opportunity in the towns of Montagu, McGregor and Robertson, happened often. The Breede River Valley gets into your blood, obviously. With the wind gusting like something out of The Wizard of Oz (there’s that scene where the wind blows a ball of hay down the road, I remember it distinctly, or have I got my movies confused?) we headed up the road that leads to the botanical garden. I was surprised to find that it lies right in the ‘burbs, not out on a limb. But development probably caught up with it, as I doubt this was intentional back in 1946 when the garden moved here from its original spot near Matjiesfontein. Despite the wind, the gardens were gorgeous. The September issue of veld and flora has a four-page spread of pics of all the flowers now in bloom – the spring display of Namaqualand daisies has to be seen to be believed, which is what inspired this blog. So, if you’re passing through Worcester in the next while, take a turn at the lights to see this magnificent spread. You have until the end of October to see the flowers. The Karoo Desert National Botanical Gardens lie at the foot of the Brandwacht Mountain, an extension of the Hex River chain of mountains that embrace Worcester on its western flank. Most of the garden, all 154 hectares of it, lies on low lying hills covered in Malmesbury shale. Only 11 hectares are developed. The rest is natural vegetation, left to do as nature intended (which is more than I can say for the endless lawns of Worcester; what it must cost in water to keep them green during summer I shudder to think. I also have a thing for quiver trees. Friends of mine, who suffer from a similar malady, travelled miles from where they bought two quiver trees on holiday (they knew a bargain when they saw one) back to their home in Somerset West, at a pace that definitely underestimated the speed limit by a long shot – put it this way: I’m glad I was not in the car with them – they were so eager to have them grace their garden. They look incredible, so the journey was well worth the abuse they must have had to suffer. The only suffering you will do, in the face of the beautiful quiver tree specimens at the national gardens, is the longing to have one of your own. They are particularly graceful and their presence is immense, mostly because the other succulents and vegetation around them are a lot smaller. Against the blue of the sky, they make an impressive statement. Then there is the kookskerm, a framework of poles with a wall of bushes packed around it, that still serves today as a cooking shelter for people of the Namaqualand. There is an example of one in the gardens that is really worth a look at. 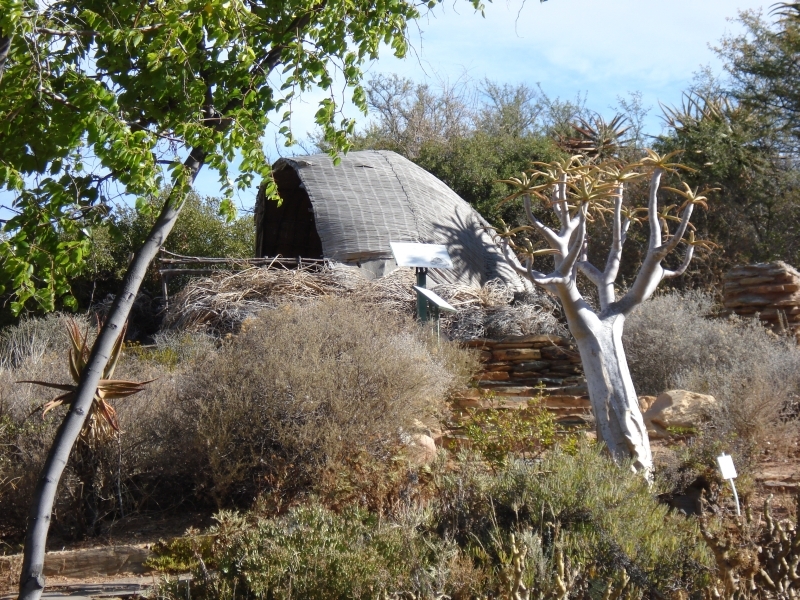 These shelters would have been made entirely from local plants in the past, with branches of the kareeboom, soetdoring or hakiesdoring used for the framework. Today, adapting to an influx of alien plants, poplars, blue gums and even wild tobacco plants are used instead, whilst plastic sheeting or hessian now often replaces the reed mats. A little further into the gardens, close to the picnic area, we came upon an entire patch of aloes, bright red and pink against the arid sand of the surrounding bed. It was so striking and particularly beautiful. The gardens have some 8 kilometres worth of walking trails, which means you can get a good walk in if you are fond of hiking. The only downside to all of this beauty, is that just over the rise is evidence of Panorama, the neighbouring suburb, and houses are edging the gardens in. there is only one type of aloe, however – aloe microstigma subsp.